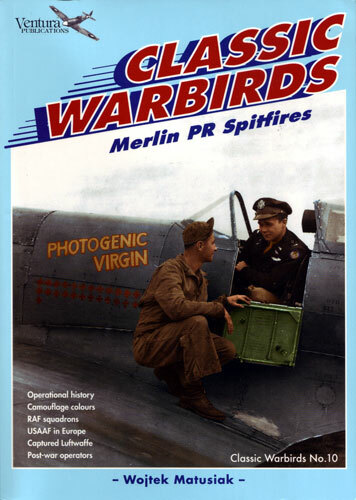 "Classic Warbirds" is a long running occasional series from Ventura Publishing in New Zealand. This series has always offered interesting (sometimes esoteric) subject matter combined with interesting text, plentiful wartime photos and attractive colour profiles. The tenth title in the Classic Warbirds series continues this tradition, but should bring these great little books to a wider audience thanks to its new association with the team at Mushroom Model Publications. Classic Warbirds No.10 is entitled "Merlin PR Spitfires". The book comprises 64 pages plus covers, and is presented in a soft cover format. The subject matter is the often neglected story of Merlin-powered photo reconnaissance Spitfires, their development and operations with the RAF, USAAF, VVS and post-war service with various Air Forces. The author, Wojtek Matusiak, has organised his material logically. The book commences with a discussion of pre-war covert operations over Germany and the transition of PR operations to the RAF's jurisdiction, although still under the influence of Australian born Sidney Cotton. 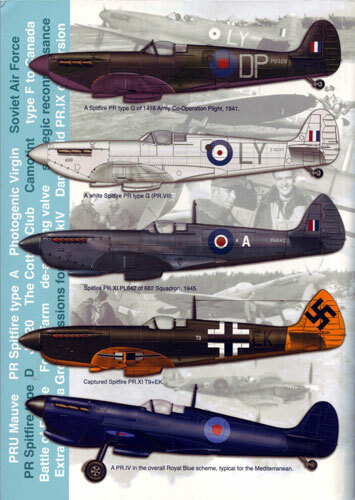 This chapter also covers the development of the first PR Spitfire types, the Type A, Type B and Type C.
The text continues with a discussion of the Photo Reconnaissance Unit and the PR Type F, Low Level conversions (Types E, G and H - the PR.XII), the first dedicated production PR Spitfire, the PR Type D / PR.IV, "Pressurised Imposters"; the Next Generation PR Versions (PR.IX and XI and the high altitude PR.X); and finally the PR>XI in post-war service. The book is rounded out with a single page of three Appendices. The first is a camouflage colour guide with descriptions and approximate FS number equivalents. This is helpful, but does not include reference to some of the more controversial (and less credible) PR colours such as PR Pink. The second Appendix covers Spitfire PR.XIII serials, with a selected bibliography completing the work. "Merlin PR Spitfires" is a compact and interesting study of this overlooked field of aviation history. The photos and profiles add to the appeal for modellers.